﻿ Chicago Hispanic Newspaper, Lawndale News, Hispanic Bilingual Newspapers, Su Noticiero Bilingue » The Venezuelan Plot to Assassinate Marco Rubio? April 19, 2019 1:55 am You are here:Home Commentary The Venezuelan Plot to Assassinate Marco Rubio? 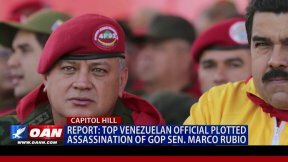 Posted by Editor on August 17, 2017 in Commentary | Comments Off on The Venezuelan Plot to Assassinate Marco Rubio? Just when news about what is happening in Venezuela could not seem more bizarre, more sinister and more hellish, now there is this weird little piece about the Venezuelan government trying to assassinate U.S. Senator Marco Rubio. The news story goes something like this; the Venezuelan government, under the control of the United Socialist Party, does NOT like criticism from anyone. Hundreds of innocent Venezuelans are being imprisoned, tortured and put on military trial for “treason” against the Venezuelan government. Strangely enough, a war of words on Twitter has been ongoing between Rubio and the Venezuelan government’s second in power Diosdado Cabello Rondon. Cabello, a long-time protege of the former socialist dictator Hugo Chavez, is the man who is second in power only to current Venezuelan President Nicolas Maduro. Cabello is also a delegate to the newly created government rubber-stamped Constituent Assembly and has been rumored to be heavily involved in the illicit drug trade. At the moment there is no corroborated information about a plot by Cabello to have Rubio assassinated, but it is not beyond the realm of possibility. Cabello is rumored to had people in Venezuela assassinated, so it is entirely possible that he could be having a plot to get rid of Marco Rubio. It just cannot be fully verified now. Nevertheless, the U.S. Department of Homeland Security has beefed up security around Rubio to make sure that nothing happens to him. With the Venezuelan government acting in an almost North Korea fashion, it is not entirely out of the question. As Venezuela becomes a one-party socialist dictatorship, it is entirely possible that the Venezuelan government will try to get rid of its opponents any way they can—even outside the country. Who knows, they might try to knock me off for some of the things I have written about the Venezuelan government over the years. Maybe I shouldn’t be giving them any ideas.